The HTC Vive Pro in undoubtedly the best quality virtual reality you can experience, but it's still expensive and difficult to set up. The HTC Vive has always been the leading virtual reality experience when it comes to room-scale immersion. Although rival headsets like the Oculus Rift have since expanded to letting you move around in a VR world, and the PlayStation VR does it to a point, no other virtual reality headsets have quite been able to replicate what the HTC Vive offers. But, it seems that HTC is about to surpass itself, by launching an upgraded headset with better resolution displays, more pixels and a more ergonomic design in the form of the HTC Vive Pro. HTC VIVE PRO REVIEW: WHAT’S IN THE BOX? It’s clear from the way that HTC has positioned the HTC Vive Pro that it’s intended for those who are already very familiar with virtual reality headsets. When you fork out the staggering £799 HTC Vive Pro price, you might be a little surprised as to what you get in the box. Despite the high price point, inside the box you’ll find the HTC Vive Pro headset itself, the link box and the DisplayPort and USB cables for connecting the Vive Pro to your PC, the power adaptor and the mounting pad for strapping down that link box. And, that’s it. To actually be able to use the Vive Pro, HTC is expecting you to already have the pair of controllers and the two base stations required for tracking all your movements. There’s currently no HTC Vive Pro bundle available that gets you all of the necessary kit in one box. Instead, if you don’t have all of the kit already, you’ll need to buy them. With the controllers costing £119.99 each, and the base stations also costing £119.99 per unit, you’re suddenly looking at an overall cost of £1,278.96 for two controllers, two base stations and the HTC Vive Pro headset. Thankfully, HTC is doing a special bundle where you get the Pro headset, two Vive 1.0 controllers and two 1.0 base statins for £1048. It's better than the standalone price, but that's still quite the VR investment. Of course, that’s not even factoring the powerful gaming PC you’ll need to run it into the equation. Turns out getting the very best virtual reality experience isn’t cheap. If you’ve already got a HTC Vive though, it’s just case of buying the HTC Vive Pro as it works with all your existing kit, and then it’s just a case of swapping the headsets and link boxes out to use it in your (hopefully) pre-prepared VR space. Aside from the internal specs boost, HTC has also spent a lot of time refining the ergonomics of the Vive Pro. Technically, it’s actually heavier than the original headset, and compared to the PSVR or Oculus Rift it feels like a deadweight. But, when you get it on your head, you quickly realise that the weight is better balanced and distributed, making sure that there’s less pressure on your face. Thanks to a new rear headrest, and a tightening mechanism on the back that’s not dissimilar to the PSVR, it sits far more comfortably than the original Vive. The area around your nose has been tweaked too, reducing the amount of light that get in and remind you that you are still in the world you left behind before putting on the headset. The original headset also didn’t come with headphones, instead requiring you to plug in any you had to hand. 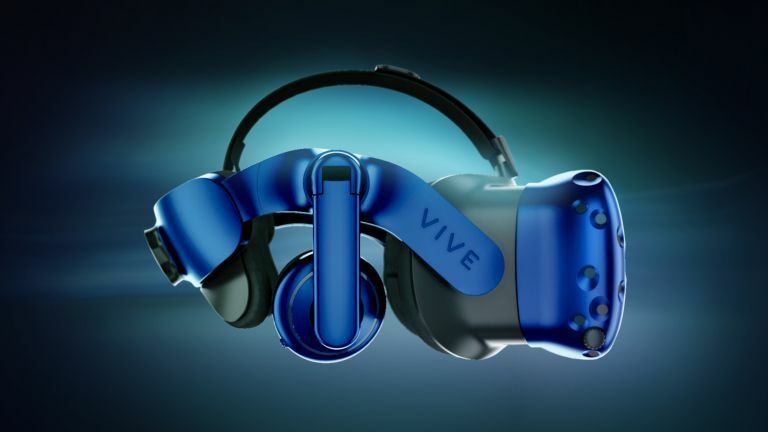 But the Vive Pro has its own headphones integrated into the design, reducing the wires hanging around your body as you play, and making the most of the spacial audio that the Vive provides. Everything sounds detailed and beefy, all contributing to the higher sense of immersion you get with the Vive Pro. What’s interesting though is that despite the fact that the HTC Vive Pro website shows a man leaping about all over the place, this is still a tethered experience. HTC is releasing a Vive Wireless Adapter that’s coming out sometime later this year, but it’ll be an additional cost for any perspective Vive Pro owners. It’s a seriously exciting and potentially game changing solution if it works as well as I hope it does, but the idea of spending any more money on top of the Vive Pro headset and all the accessories makes me bauk. As someone who hasn’t used the Vive in their current abode, I’d forgotten just how much of a faff it is to get everything set up. You have to download the drivers from the HTC Vive website, run the setup software, get everything plugged in, position the sensors by balancing them on bookcases, tripods or screwing them into your walls, map the space that you want to use to play Vive Pro games and then run through the tutorial. That’s before you factor in that you’ll have to clear enough space in your room to actually play. There is a standing only option for small spaces, but for the full HTC Vive Pro experience you’ll need a space at least 2m by 1.5m/6.5 feet by 5 feet. For most UK homes, that’s enough space to constantly think that your rooms are just a little too small. It doesn’t help that despite running the room setup several times, the software kept shifting the play space to the right, putting me in constant precarious proximity to breakable things and the very full fish tank. The tracking isn’t always perfect either, occasionally losing sight of one or both controllers mid-game. Not great when you’re trying to take on a swarm of aliens in Doom VFR. But regardless of the complexity of the setup, there’s nothing more rewarding than the virtual experience the HTC Vive Pro has to offer. The difference between the original Vive and the Vive Pro is staggering. The biggest upgrade is the improved sharpness. The twin AMOLED screens deliver a 2,800 x 1,6000p resolution (that’s 1,400 x 1,600p per eye), which equates to a 37% boost in pixels-per-inch, and 78% more pixels overall. In reality, it means that you can’t see the pixels anymore, like you could with the last generation HTC Vive, or any of the VR competitors. That sensation of seeing the pixels that make up the screen is always something that heavily detracts from the immersion you get from the games you’re playing or experiences you’re having in VR. But that’s gone with the HTC Vive Pro, and that seriously changes the overall VR experience, as it makes it easier to forget you’re still standing in your living room looking like a plonker, rather than actually surviving the wastelands in Fallout 4 VR. That improvement in resolution and pixel density also makes text a lot easier to read. There’s a definite sharpness increase, which again adds to the sense of immersion you get with the HTC Vive Pro. When it comes to the PC you’ll need to run that kind of experience, HTC recommends that you use a PC that has at least 4GB of RAM, an Intel Core i5-4590/AMD FX 8350 or better processor, and an Nvidia GeForce GTX 1060/AMD Radeon RX 480 or better. My gaming PC is running a 3.5GHz Intel Core i5-6600 CPU with 16GB of RAM, but it’s only got an Nvidia GeForce 980 Ti graphics card, proving that having a 1060 or above isn’t actually necessary. HTC VIVE PRO REVIEW: IS IT WORTH THE MONEY? The HTC Vive Pro is an odd one to recommend at this stage. It’s clear that it’s the best immersive virtual experience you can buy right now. The clarity and detail is such a contrast to the original headset it feels less like a Vive 1.5 upgrade than a total visual overhaul at times, particularly for the big AAA VR releases from the likes of Bethesda. But the timing and the pricing feels off. If you got all the gear and the forthcoming Wireless Adapter in one box, it feels like it could command the premium price tag. With pre-orders in the UK already sold out, there’s clearly a demand for better quality VR, but I can’t help feeling like waiting a few months to get the Wireless Adaptor too would just seal the deal. Should I buy the HTC Vive or HTC Vive Pro? The HTC Vive Pro might offer the best virtual reality experience on the market, but having to buy all the extras to even use it makes it a very expensive proposition for someone who’s coming to VR from scratch. It’s a confusing proposition for anyone who’s not au fait with virtual reality requirements, so anyone who wants to get started should just get the original and complete HTC Vive package for a reduced £499, and anyone looking to upgrade should go Pro.